Hyperbole is when you use language to exaggerate what you mean or emphasize a point. It’s often used to make something sound much bigger and better than it actually is or to make something sound much more dramatic. Hyperbole is a figure of speech. In this example, the speaker doesn’t literally mean that there’s enough food in the cupboard to feed the hundreds of people in the army. Instead, the speaker is using hyperbole to exaggerate the amount of food that they have. Hyperbole can also be used to make something sound much worse than it actually is. For example: “This is the worst book in the world!” – the speaker doesn’t literally mean that the book is the worst one ever written, but is using hyperbole to be dramatic and emphasize their opinion. 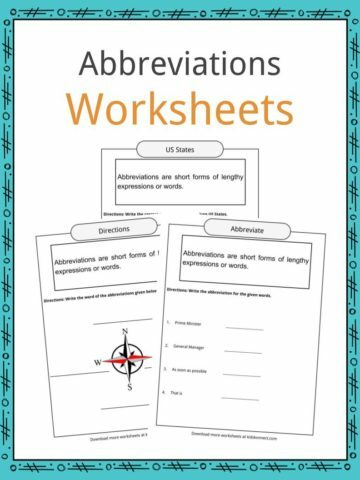 In American and British English, hyperbole is pronounced ‘HI-PUR-BOW-LEE’. 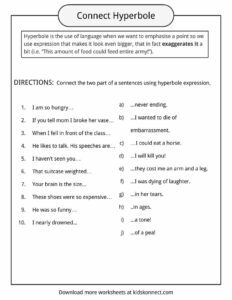 Take a look at the following list of hyperbolic phrases. How many of them have you heard or used before? He’s running faster than the wind. This bag weighs a ton. That man is as tall as a house. The shopping cost me a million dollars. My dad will kill me when he comes home. Your skin is softer than silk. She’s as skinny as a toothpick. She was so happy; her smile was a mile wide. The footballer is the best player of all time. It’s impossible to complete this puzzle. Next Friday is never going to arrive. I’ve read this book a hundred times. My hand hurts so much it’s going to drop off. My brother is stronger than iron. I’m so sad that I’m drowning in tears. The leaves are dancing in the breeze. Hyperbole is often used in poems and books because it helps to emphasize part of the story and evoke a response from the reader. 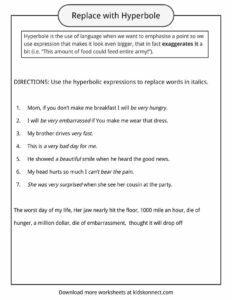 Hyperbole can help the writer to get their point across so that you understand the emotion, seriousness or humor of the situation. In this example, Macbeth is using hyperbole to say that not even an entire ocean could wash his hands clean. Macbeth is using hyperbole to exaggerate the situation. In this example, the author is using hyperbole to emphasize how slow and boring the town is. 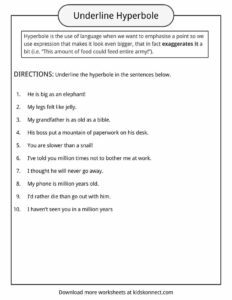 The hyperbolic phrases in this sentence help the reader to understand the situation as, without them, the sentence doesn’t appear as emotive. 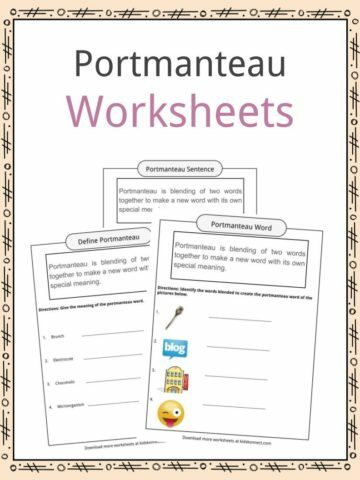 Have a go at re-writing Harper Lee’s sentence above without the hyperbole and see how it sounds! The following poem by Shel Silverstein, titled ‘Rain’, shows some great examples of hyperbole. Can you identify them? 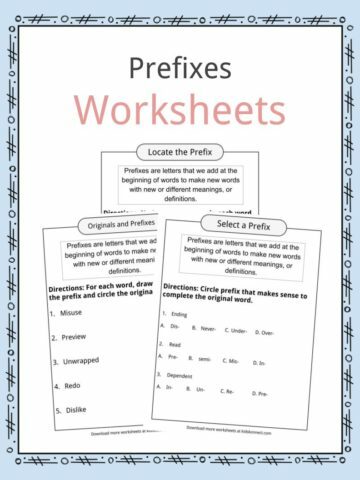 This bundle contains 5 ready-to-use hyperbole worksheets that are perfect to test student knowledge and understanding of what hyperbole is and how it can be used. 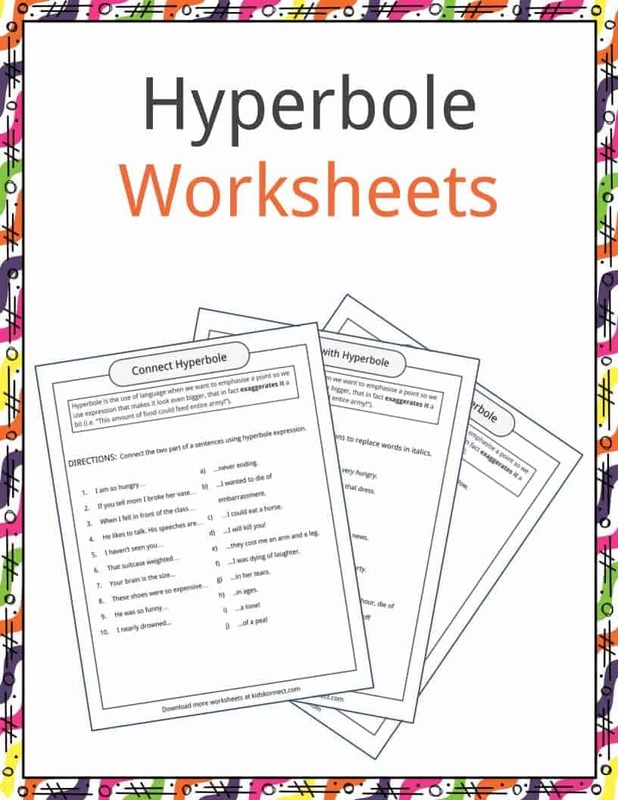 You can use these hyperbole worksheets in the classroom with students, or with home schooled children as well.